Traditionally painted Easter eggs have been enjoyed and passed along as a specialized 'art' for generations. 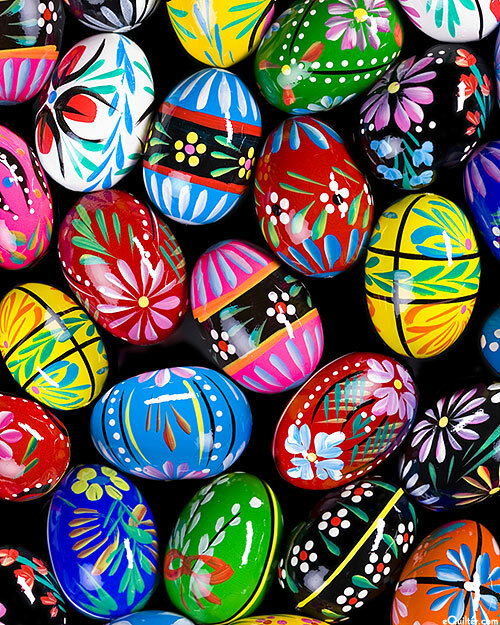 Ukrainian Easter Eggs re generally decorated with traditional folk art designs, sometimes using a wax resist technique, but these examples are hand painted. Digitally printed, Easter eggs are about 2-1/2", 'European Painted Easter Eggs' by the Rubin Design Studio, designed exclusively for eQuilter. "Hi Luana I received my material TODAY!!!! I want to thank you for such fantastic service, and a very big hug for the extra FQ surprise. You are one of my favorite online fabrics shops.:o)..."